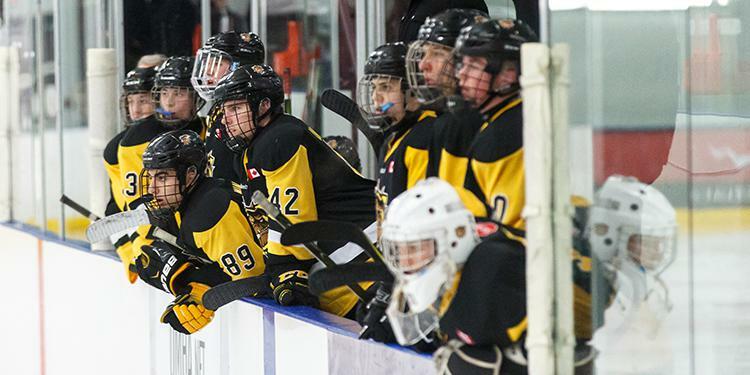 The Ontario Minor Hockey Association has released the fourth edition of the Minor Midget and Midget AAA Top 5 Rankings powered by Under Armour for the 2018-2019 regular season. These rankings will be released on a bi-weekly schedule. There is still plenty of movement within the top five which shows that everything is still up for grabs. Here's some of the teams making their mark. The Wildcats keep their winning ways and their hold on the top spot. The Express hit a rough patch and drop two spots while the North Stars leapfrog them into second place. North Central had another strong two weeks while the Hurricanes stay alive in the top five. Daniel Michaud (Quinte Red Devils) - Michaud has a big frame which makes him tough to contain. 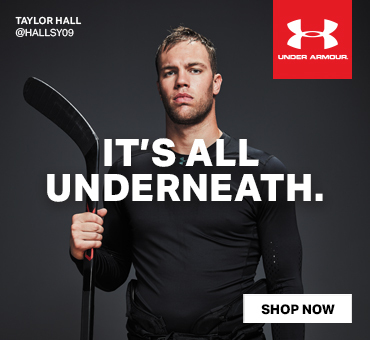 He often fights through checks, using his strength and body to protect the puck. He makes checking him even tougher when he is in full-stride. Michaud has very good speed and uses his long, powerful stride to separate from defenders. He can either drive to the net for scoring opportunities, or gain the offensive zone and use his vision to find his teammates. Being strong on draws and having a good reach are tools that allow him to help out defensively. James Jodoin (Oakville Rangers) - An all around defenceman with many tools for any situation. Jodoin has good size and he uses this in his defensive zone to check forwards and separate pucks. His skating and puck handling ability allow him to transition from defence to offence. He has his head up where he reads whether to make a strong first pass or to use his skill and skate the puck out himself. In the offensive zone he moves well along the blueline, creating open lanes for shooting or passing. Jodoin can play a lot of minutes as he can play in a lot of situations. The Bulldogs continue their rise with a pair of wins and ties and are rewarded with the number one spot. 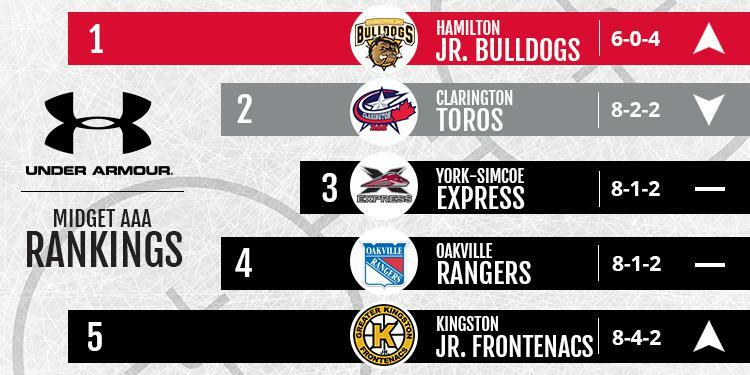 The Express and Rangers hold steady and keep their momentum while the Kingston makes its first appearance in the top five. Kameron Kujala (Grey Bruce Highlanders) - Kujala is the smooth skating puck moving defenceman every team is looking for. He is calm under pressure and often uses his vision to get himself out of tough situations. Kujala loves to control the play and can change the course of a game with any shift he is on the ice. The Highlanders defenceman always finds a lane to get the puck through from the blue line and is a true quarterback for this team. Noah Quarrington (North Central Predators) - The hard-nosed Predators forward has been problematic for the opposition defense all season. Quarrington uses his strong skating ability to back defencemen off the line and open some room for not only himself but his teammates. Playing the wing, Quarrington is a staple in his own end, blocking shots and taking away passing lanes for the opposition. The two-way forward really exemplifies what it means to be a 200-foot hockey player.